This is a good book. It helped me breathe a deep breath in the chaos of mothering young children. It helped me clearly see that children are like a payment we can receive joyfully—and one we must handle wisely. No matter the struggles we face, our children are a reward. This book is akin to having an exceptional mentor. 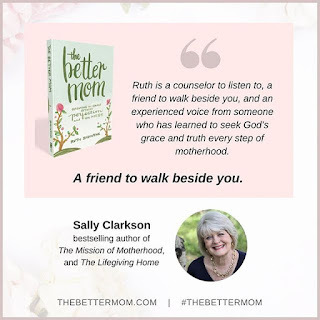 It hits on the topics Christian moms truly care about. We want to know how to care deeply for our children and keep alive ourselves. Ruth reminds us that God used suffering and pressure to help Paul learn to rely on God’s strength. God used hardship to teach him to focus on building up an eternal kingdom. This is what we yearn for in our own hearts and those of our children. She calls it the blessing of our own weakness. This is a great read for navigating the mess of motherhood with grace. It will bless you and remind you that, like it says in Psalm 127, your children are arrows and a reward. May you be blessed in your mothering. This book was graciously provided by Zondervan Publishers for review. Affiliate links are a great way you help your favorite blogger fill bags for the homeless.